Henry A. Taylor Building (Image Source: Milford Regional Chamber of Commerce). 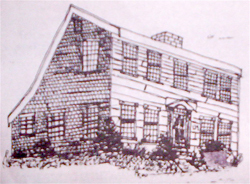 The Milford Preservation Trust will hold its annual meeting on Tuesday, June 7, at the Henry A. Taylor Building, 5 Broad Street, Milford, Connecticut, at 5:30 pm. After a brief business meeting, there will be a presentation on Henry A. Taylor and the history of the Taylor Building, which today is home to the Milford Regional Chamber of Commerce.